Hope everyone is having a Blessed Christmas! 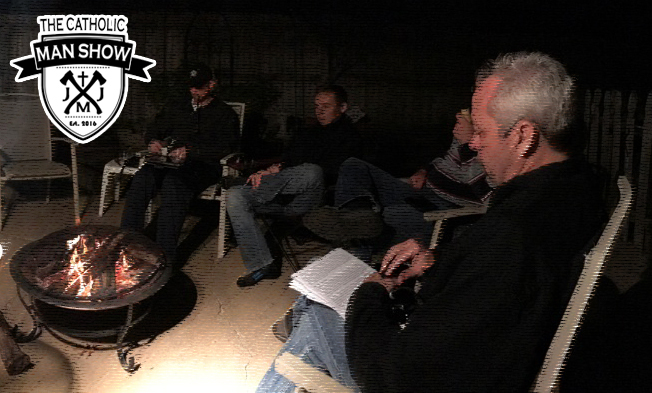 Our group (including Adam and David from The Catholic Man Show) meets monthly at my house. We have a great time and always look forward to the discussion. It’s really very simple to get a group going. And there you have it, the beginnings of a great group of men growing in faith together! I think the biggest thing holding most men back is the question of “what do we study?” There are a ton of resources out there. I’ll give you a few suggestions to start with. First, you may want to think about what you want to study. The bible, Catholic faith formation, Apologetics, Catholic Men’s Spirituality, etc. There are many resources for all of these. DynamicCatholic.com has many printed resources at a very low cost. Here is also a resource for all inclusive Catholic Bible and Faith Studies that you can purchase. If you are interested, I have a 52-Week series coming out on my blog, The Pint, The Pipe and The Cross starting on Jan 2, 2017. The series is called “A Weekly Defense of the Faith” and it will cover all of the core teachings of the Catholic faith. It is intended to be a source of learning why we believe what we do, being able to give an answer for what we believe and come to a greater depth of belief at a personal level. My plan is to follow the following format. then follow with a reflection and closing prayer. This could be something that you include in your weekly devotion and prayer time as well as discuss at your monthly men’s meeting. Make this a part of your New Year’s Holy Strategy! So what are you waiting for? Get 2017 started off right! Remember…We are on the winning side, so raise your glass. Cheers to Jesus!